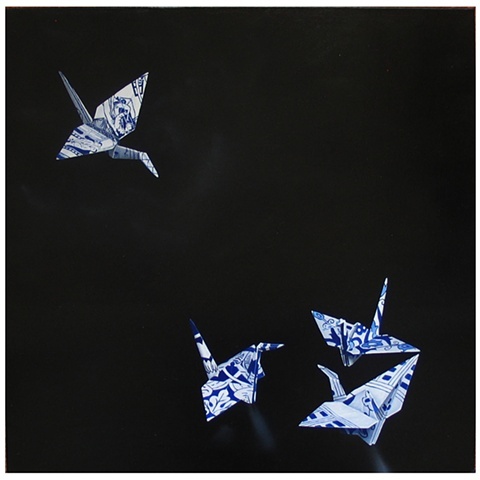 The origami bird flying down to join the group is of Chinese origin and he is approaching a group of Dutch Delft ladies. All the birds are from a similar period of history- following patterns and pictures from the 18th century. Much Chinese blue-and-white ware was imported to the Netherlands in this period until internal Chinese fighting made it difficult to ensure a regular supply. At this time the Dutch began to make their own westernized versions of this beautiful genre, of which these three ladies are fine examples. Though to an un-trained eye the Chinese bird might pass muster, on closer inspection we find that he actually constructed of a beautifully drawn early pornographic work. There is no doubt that he is going to find it very difficult to cross the cultural barriers to be accepted into the Dutch ladies society, however much he may resemble them on the surface. He had trouble mingling in polite society.